When you think of GPS fleet tracking in Canada, you probably think first of for-profit commercial enterprises. But as the experience of Second Harvest shows, the use of a Geotab system can bring amazing benefits to those companies in the not-for-profit sector as well. GPS to GO is a reseller of Geotab fleet tracking systems in Canada. Second Harvest is a well-known “food rescue” program based in Toronto, Ontario. They are a unique organization that picks up perishable food, which would otherwise be wasted, from grocery stores and restaurants; they then deliver that food to those in need at shelters and social agencies in the city. Although they use refrigerated trucks, there’s still a slim time-frame of freshness on the perishable items they transport, meaning absolute efficiency is paramount for Second Harvest. That’s where GPS fleet tracking has been incredibly beneficial for their operations: when Second Harvest learns of available food for pickup from donors, the organization can quickly locate the closest truck on the road and get it there quickly. Idle time on their trucks was reduced by almost 31% per day. Maximum vehicle speeds reduced by 7%. Average total stops increased by 7.6%. Daily distance driven increased by 4.5%. All in all, Second Harvest’s hard-working team of drivers were shown to have reduced their maximum speeds while increasing their daily distance driven and average amount of pickup stops. The investment in a Geotab GPS fleet management has also paid off in the sense that Second Harvest now has “hard data” about the efficiency of its fleet. With that data and information readily available, donors to the organization can rest easy knowing that their donated dollars are going to the right part of the business. 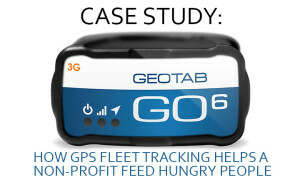 As you can see, although Second Harvest is a non-profit organization with a noble mandate, GPS fleet tracking with Geotab has many of the same great benefits for their type of operations as it does for a strictly commercial organization. If you want to see better results in the efficiency of your non-profit operation, register to see a live demonstration from GPS to GO today!